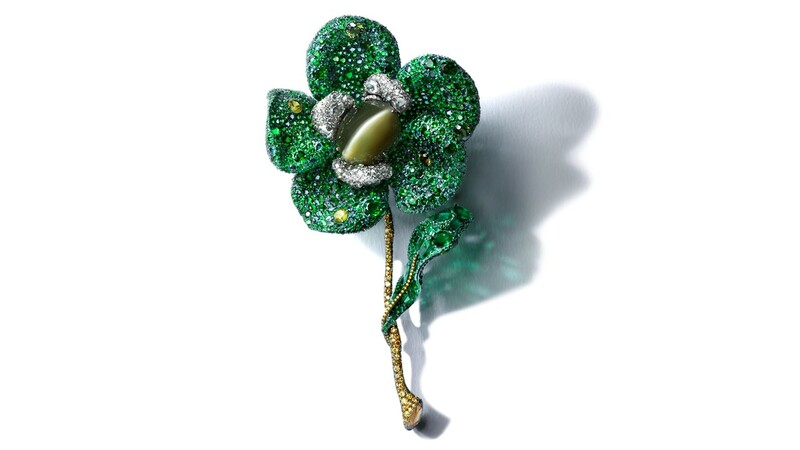 The whimsical brooch is titanium based and features a rarely seen 105-carat Chrysoberyl Cat’s Eye and nearly 2,500 green gemstones amounting to 145 carats carefully selected and set amongst yellow and brown diamonds. Chao skilfully plays around with gemstones sizes, shapes, hues and light reflection to create The “Greenovia Brooch” that is harmonious yet bold, naturalist yet somewhat imaginative. Each Black Label 360-degree piece requires more than 10,000 hours to complete, using 18th century artisan wax mouldings and all individually sculpted. Cindy exhibited her work for the first time in the UK at Masterpiece 2018 and was the only Asian high jeweller present at Masterpiece where she unveiled her new Black Label Masterpieces and White Label collections, winning the ‘Outstanding Object’ award for the Peony Brooch. All pieces are hand sculpted organic forms whose philosophy is to create high jewellery as pieces of art, and through this, to redefine the perception of high jewellery.